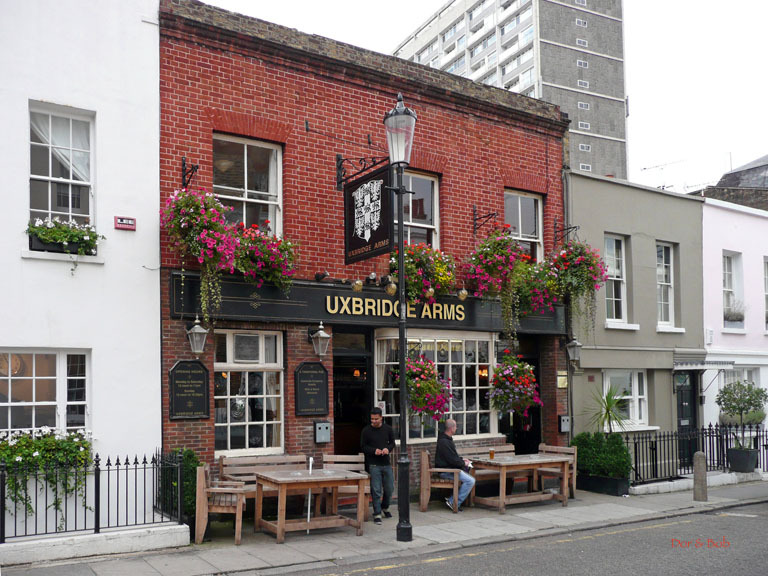 The Uxbridge Arms is a traditional pub, both in its appearance and in its atmosphere and clientele. Itâ€™s in a quiet neighborhood and so is the atmosphere, but itâ€™s well patronized and conversation is wide-ranging and general. We had one of the most welcoming receptions from other customers than weâ€™ve ever had anywhere else (it was Thursdayâ€™s â€œold-timersâ€ night). The bar is square-shaped and is in the center of the space. Small rooms exist around the bar on each side. Decorations are military-related. There is a fireplace and the usual varied stools and tables. Out front on the sidewalk are two nice wooden tables and benches. The exterior of the building is brick and decorated with lovely bright-colored hanging flower baskets. There are three real ales available.